Mytilene (Greek: Μυτιλήνη; Mytilini in Modern Greek) is a town and a former municipality on the island of Lesbos, North Aegean, Greece. Since the 2011 local government reform it is part of the municipality Lesbos, of which it is a municipal unit. It is the capital of the island of Lesbos. 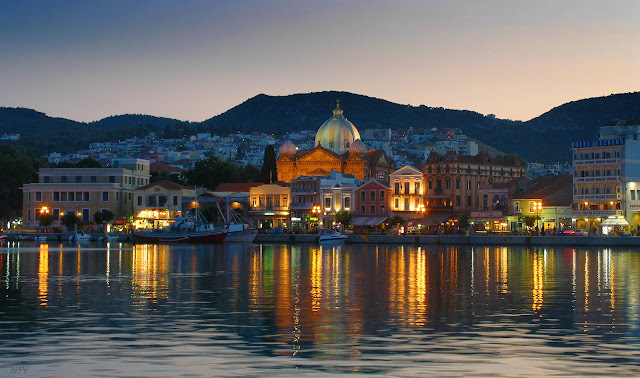 Mytilene, whose name is pre-Greek, is built on the southeast edge of the island. It is also the seat of a metropolitan bishop of the Orthodox church. Mytilene has a port with ferries to the nearby islands of Lemnos and Chios and Ayvalık and at times Dikili in Turkey. The port also serves the mainland cities of Piraeus, Athens and Thessaloniki.The city produces ouzo. There are more than 15 commercial producers on the island.The city exports sardines harvested from the Bay of Kalloni and olive oil and woodwork. The reflections on the water are so lovely - great shot! Just amazing the beautifully colorful water reflections you have in this photo! Thank you! I love how you did it. The glows are so clear, neat shot.